First, practice removing your lenses with a tissue. The tissue should make removing these moist lenses easy, and can always be used as a “back-up” removal method if needed. 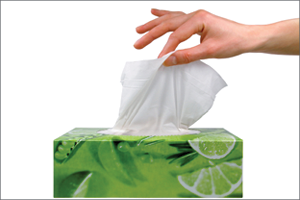 Place the tissue over your forefinger and thumb. Using a strong narrow pinch, with the fingertips at the 5 and 7 o’clock positions on the lens, apply slight pressure; wait for a “1, 2” count and then roll fingertips together and back toward the palm of the hand. Once you are comfortable and confident using a tissue to remove your lenses, you can practice removing the lenses without the tissue, using a strong narrow pinch with very dry fingers (in place of the dry tissue). Using your finger on the opposite hand, pull down your lower lid gently. Place very dry fingertips at the 5 and 7 o’clock positions on the lens and apply slight pressure; wait for a “1, 2” count and then roll fingertips together and back toward the palm of the hand. Fingers need to be dried with a towel between each removal attempt. Rubbing fingers together until heat is felt from the friction will also ensure fingers are completely dry. Clean Your Duette Lenses Daily! With the pad of your ring finger, gently rub the entire lens in a circular motion against the palm of your hand. Be sure to thoroughly clean the front and back of the lens and then rinse it well with a saline solution such as LacriPure from Menicon. Store your lenses in either a hydrogen peroxide system OR multi-purpose disinfecting solution, as recommended by your eye care professional. If lenses have TangibleTM Hydra-PEG coating, alcohol-based or abrasive solutions should be avoided. Click HERE for more Lens Handling & Care Information.